Vegan in Japan? I can sense your scepticism from the other side of the screen. Japan is haven for foodies and many return home with a faraway look in their eyes as they recall yakitori chicken skewers, takoyaki octopus balls, pork tonkatsu curry and a bowl of warming ramen generously packed with meat, fish and egg. There’s a good chance that dishes are made with dashi (fish stock), bonito flakes have been liberally sprinkled over everything and soba noodles are served with a floating raw egg on top. But stay with me, travelling as a vegan in Japan is certainly possible, and fun! Many parts of the world are only slowly coming around to the idea of veganism, and it’s likely to cause a slight element of confusion in most countries. But life is too short to stay at home and dietary requirements should never get in the way of travel. We’ve already whipped up a post about vegetarianism in Japan here, so here are a few tips that should help vegans (or the veggie-curious) on their Japanese journey. A treat for vegans and carnivores alike, no-one will be disappointed eating a shojin-ryori meal. As a traditional cooking style of Buddhist monks, these exquisite and colourful meals can be found at temples. Cast any fear about stray bonito flakes, or accidental eggy additions aside, shojin-ryori are always entirely vegan. Expect a delicious combination of seasonal vegetables, wild plants, and tofu, all presented like a work of art. Try a Shojin-ryori meal in Mount Koya. How to be sure your dinner’s plant-based? Make it yourself! The teachers at this English-speaking cookery school understand veganism and are more than happy to tailor their classes for dietary requirements. 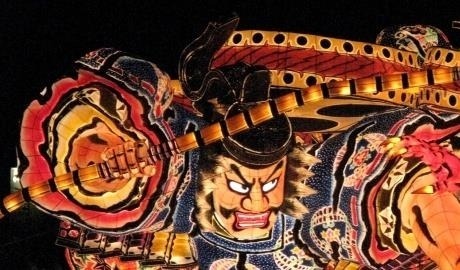 Taking place in a machiya townhouse in Kanazawa, home to a well-preserved samurai district, you get a taste of history thrown in for free. Forget fish, according to the teachers here the most important ingredient in Japanese cooking is koji, a micro-organism often used in Japanese seasonings. It turns out you can always use koji in place of dashi, who knew? All made with seasonal produce, dishes may vary, but veggie sushi rolls and a miso-marinated tofu dip (in place of mayonnaise) is a favourite. Find out more about taking a vegan cookery class in Japan. Kaiseki meals are similar to shojin-ryori but aren’t vegan or vegetarian so you must specify your preferences in advance. 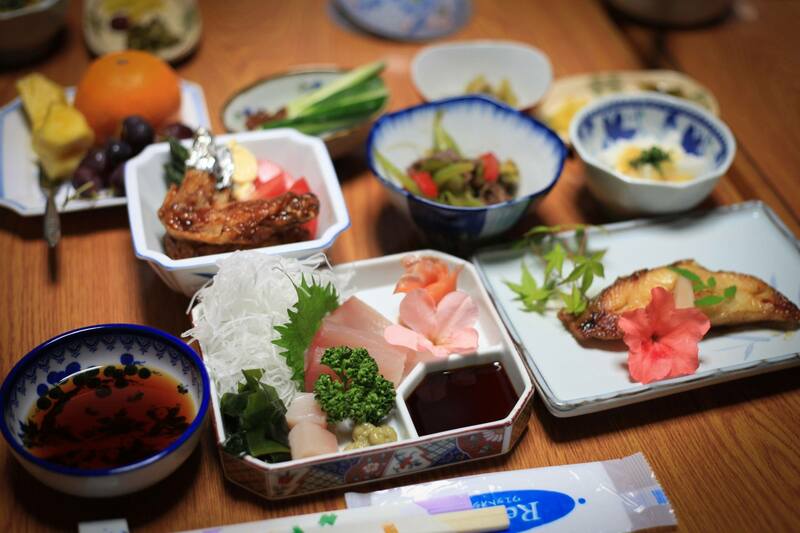 They are made up of lots of little dishes (think Japanese tapas) and served at ryokan – traditional lodgings with futon beds, tatami flooring and relaxing onsen (hot spring baths). Seasonal and delicious, this was (without doubt) my favourite meal in Japan. 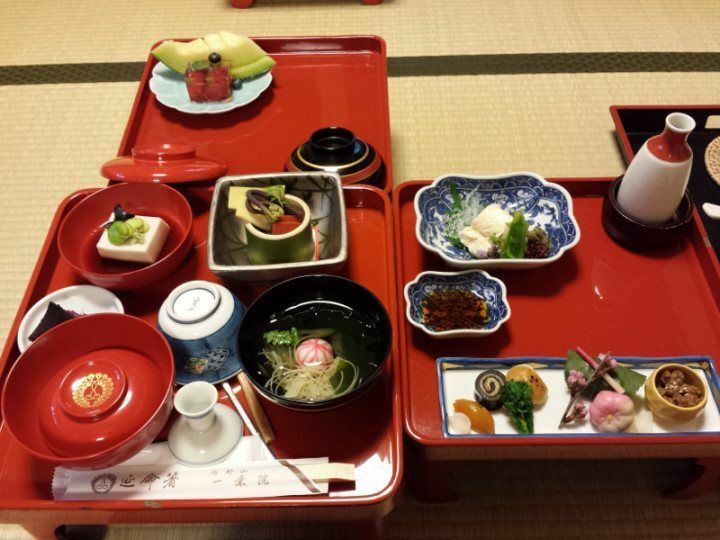 Try kaiseki at a ryokan. While most famous for its huge seated Buddha, the city of Kamakura has so much more going for it; the Meigetsuin gardens and the Tsurugaoka Hachiman-gu shrine are only a short walk from the train station, there’s a nearby hiking trail and it is right next to the sea – refreshing sea air and open spaces after time in the capital. Plus the city is only a short journey outside Tokyo so those short on time can hop on the train for a day trip. “That’s lovely”, I hear you say, “but what does any of this have to do with veganism?” Well, my friend, brace yourself for the San Fran of Japan with macrobiotic restaurants, delis, and specialist vegan restaurants galore. 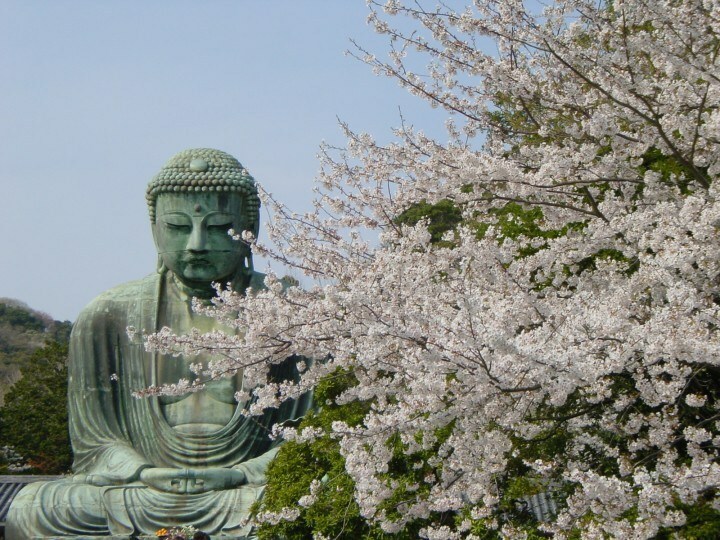 Find out more about Kamakura. Need more info for travelling to Japan with dietary requirements? Get in touch with our team to plan your holiday.